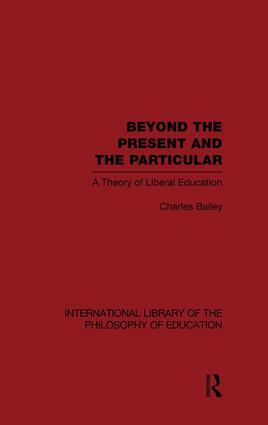 Charles Bailey advances a modern characterization and justification of liberal education and defends such a view of liberal education against contemporary challenges. The book will be of special value to those guiding educational policy, designing curricula and reflecting on their own teaching practice. An introductory part of the book describes the need for justification and the special nature of liberal education as compared with other characterizations of education in utilitarian terms. The author offers a positive account of the content of liberal education, after a consideration and critique of the work of Paul Hirst, Philip Phenix and John White and follows this with an account of teacher strategy, attitude and methodology appropriate to liberal education. The final part of the book describes contemporary trends and challenges to the idea of liberal education and shows how they fail to provide a coherent alternative to liberal education as a basis for universal compulsory education.